‘Char Dham’ project gets a green flag from the Supreme Court on Friday. 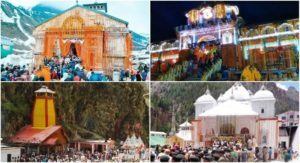 The project aims to provide all-weather connectivity of Yamunotri, Gangotri, Kedarnath, and Badrinath. The apex court refused to stay ongoing construction work. However, the court said any fresh project will now be only undertaken if the Environment Impact Assessment (EIA) gives a clearance. Under the ‘Char Dham’ project, there are 53 separate and independent projects out of which work is on for 28 projects while 25 are yet to start under the scheme which is spread over 900 km. Some Non-Governmental Organisations (NGOs) and local residents of Uttarakhand opposed the project claiming that the construction will damage the environment and disturb the ecological balance, reports Times of India. They claimed that the EIA clearance wasn’t taken before the construction. Their plea was, however, rejected by the National Green Tribunal which said that statutory EIA under the Environment Protection Act wasn’t required as an exemption was granted in 2013 through a notification. However, after clearing the project the Tribunal, to keep a check on the implementation of Environment Management Plan (EMP) of the project, appointed committee of experts headed by former Uttarakhand High Court judge UC Dhyani.